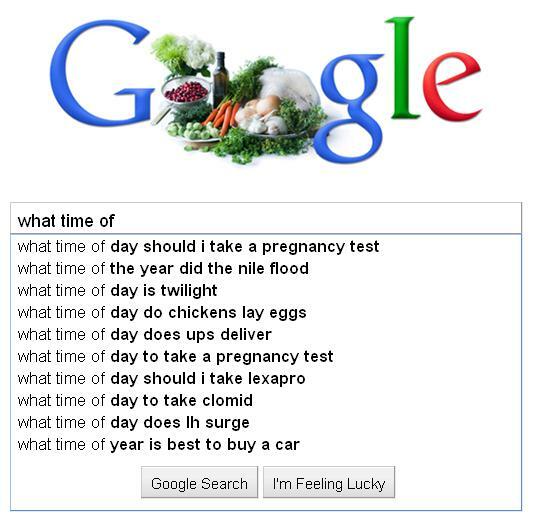 Google Game: What time of…? The theme of today’s Google Game may not be readily apparent upon first glance. It wasn’t to me. But a little rumination on this selection of seemingly disparate searches revealed that many of us are looking for very much the same thing: rebirth and renewal. First, a series of quick definitions to get you up to speed. Lexapro is an antidepressant. It turns sad into happy. Clomid is a popular drug for women that induces egg-production by stimulating the release of LH, or leuteinizing hormone. Clomid turns barren into fertile. And for those of us who have forgotten what twilight looks like — either because we live in cities where street lamps obscure the natural dimming of day, or because we are tweens lost in a fantasy of puritanical undead lust — it is that mystical hour when the sun doffs its glow and settles below the horizon, giving way to night. It’s when the world takes on a gauzy ephemerality and the universe gently reminds us that each day ends and bows to the next. And just as today begets tomorrow, ourselves beget the next generation. As do our chickens beget their own. All this in the way that the flooding of the Nile was believed by the ancients to be the yearly visit of the fertility god Hapi, whose gift of rising waters nourished the arid soils for harvest. We don’t receive gifts this way anymore, do we? No, we wait impatiently for UPS or seek out holiday sales to buy a new car. And we certainly don’t rely on a stork (or a chicken?) to deliver us a bundle of joy. We search for ways to turn ourselves into the people we want to be. But have we just replaced our old gods with new ones? At least Google answers when you call. This entry was posted in Google Game and tagged antidepressants, eggs, Google Game, pregnancy, rebirth, renewal. Bookmark the permalink. Lovely and poetic…going in The Book. Google, can you hear me? I cant believe you didn’t use the google game I sent you. Disgustingly priceless. And Anonymous, say hi to Roma for me. Finally, Egypt makes it into the Google game. About f’ing time. And at the number 2 spot, no less. Did I get my Egypt facts straight? Or can you tell I just googled it?